Interested in learning more about using data maintenance techniques to do even more at your nonprofit? Check out this recap of our latest webinar, hosted with our friends at TrueGivers. We went over all our favorite data stewardship tips for nonprofit professionals, whether they use excel or a comprehensive database like Neon. Veteran fundraiser Roger Craver, Editor of The Agitator, author of the classic Retention Fundraising: the new art and science of keeping your donors for life, and a partner in TrueGivers outlines why basic data stewardship is the foundation of successful fundraising. Whether you use the integration Roger describes or not, here are some fundamentals that every fundraiser should practice. At TrueGivers, we’re focused on enabling all nonprofits to operate like The Big Ones using specialized data sources and advanced technology. We are guided by a simple principle: better data means better apps. Traditionally for nonprofits, “better data” has meant “expensive consultants and low transparency”. This creates barriers for small, young, and growing nonprofits alike. We are here to break down those barriers. Data services don’t have to be expensive, and they don’t need to be so complex that you can’t understand them. I’m continually amazed by the ways that the most mundane –but absolutely essential—tasks of keeping donor records updated are too time-consuming and complex for everyone from first-time volunteers to the most sophisticated fundraisers. Everyone talks about the benefits of donor stewardship and how to do it. It’s feasible for everyone in your organization to evaluate your donor stewardship and make low-cost changes with high impact today – right now. For example, small adjustments like sending thank you letters one day after receiving a gift compared to three days after can have huge, positive impacts on your relationships with donors. As our society becomes more reliant on data to make decisions, so do we fundraisers. A different, growing challenge for non-profits is data stewardship. By this, I mean using data services to correct addresses, mark deceased donors, and add critical information like age, income and other essential information. There’s good news: you alone aren’t responsible for practicing good data stewardship. Sustainable data stewardship depends on collaboration and mutual understanding between Applications (tools and services), Developers (the “makers”), and Organizations (that’s you!) Your technology partners have tools in place to help you assess your data health, and to also think of smarter questions to ask. CRMs and other technology solutions provide an invaluable asset: a place to store data. When your database is full of low quality, incomplete, outdated, or just plain wrong data, it’s not serving you. But it can be challenging to understand how your data health is impacting your success. That’s why data stewardship is so important. Good data stewardship makes it easy to answer big questions about data health. It can help you transform deceptively simple questions into nuanced discussions. If there’s one thing I’ve learned in my decades as a fundraiser it’s that good data stewardship provides an easily accessible, consistent and transparent overview of all the data assets in a database. That’s why I’m thrilled by new TrueGivers and NeonCRM Integration. This integration automates data stewardship by correcting addresses, marking deceased donors and adding critical information like age, income and other essential information. Now these basic but all-important tasks can be performed automatically and inexpensively. When you enable the integration, TrueGivers gets to work immediately. Most users can get up and running in less than 5 minutes. We create a dashboard that shows a high-level analysis of your file. This helps you evaluate your organization’s data health. As we identify changes, we begin to populate the dashboard and update your records. In mere minutes, we’ll finish a full scan and update records in your database with current addresses, deceased information, and Real Estate & Individual Data Enhancements. The TrueGivers and NeonCRM Integration Dashboard provides high-level summary information. Note: If you have selected the monitoring only option, we create and maintain your dashboard, but we don’t update any of your records. As I emphasized in Retention Fundraising: the New Art and Science of Keeping Your Donors for Life, among the simplest of what I termed “easy retention wins” is keeping your donors’ addresses up to date. After all, if you can’t communicate with donors you’re unlikely to hold on to them. It’s sad but true that, on average, 11% of all U.S. nonprofit mail appeals won’t even be delivered. That’s because nearly 45 million Americans move each year, and for many, their mail is undeliverable because of incorrect addresses. The result for nonprofits? Wasted money. Lost revenue. Lost donors. This is a senseless waste. National Change of Address (NCOA) service improves delivery rates by providing new addresses for people and business who recently moved. Additionally, the service flags undeliverable, invalid, and vacant addresses. To add insult to injury most organizations pay far too much for this basic service. That’s one reason why TrueGivers provides a highly accurate and very low-cost automatic system for NeonCRM users. 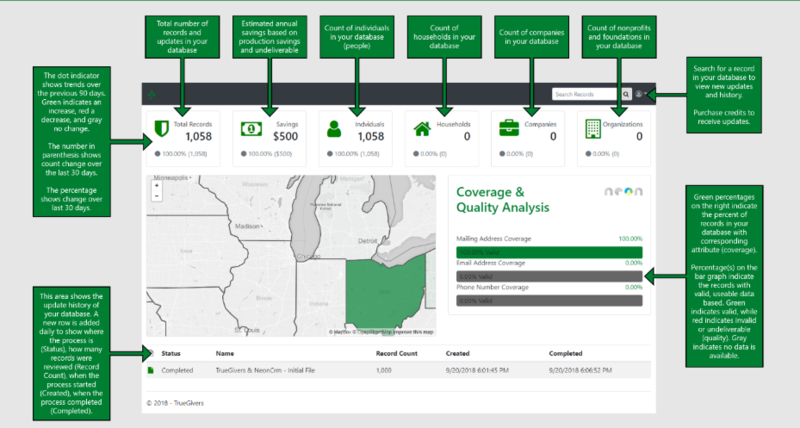 It even allows you to select a “monitoring only” service level, which process your file and creates a dashboard that summarizes your data quality and coverage. Most importantly, NCOA helps you retain donors and build relationships. According to AFP’s Fundraising Effectiveness Project, nonprofit organizations retain 46% of donors annually. There’s no question that a significant portion of donor loss or attrition can be attributed to incorrect addresses. Between wasted mail pieces that never reach their destination, postage and penalties, an NCOA process can save you up to $0.95 per bad address! When your mail list contains accurate, mailable addresses more of your direct mail pieces make it to their intended recipient. This leads to less waste and a higher ratio of mail getting to the right person – which is exactly what you want when improving your delivery rates. This supports your organization from top to bottom, and helps you move relationships forward during qualification, acquisition, solicitation, and stewardship. The fallout from just one mismanaged interaction can produce shock waves. Can you think of a bigger motivator for a negative response than to address a solicitation to a deceased volunteer or donor? How about a more cringe-inducing phone call than when a gift officer asks “How’s Bob doing” only to find out that Bob passed away 10 months ago. On the positive side, having a notice of a death can trigger a significant stewardship opportunity by expressing your gratitude for the deceased and their support over the years. There may even be an opportunity for the family to honor the deceased. The TrueGivers and NeonCRM Integration also allows you to determine if there are recently deceased members of a household on your file before you perform any outreach. While you want to avoid insensitive communication to a surviving family member, you may also want to share your condolences with them. Saving money is not the primary concern when using deceased suppression processing, but it is a factor even if you are not using direct mail. Regardless of the channel, avoiding insensitive communication with your donors and constituents is important. Respectful communication can create future stewardship opportunities. At almost every board meeting of the hundreds I’ve attended, inevitably, these questions are asked: “Who are our donors?” ”How old are they?” “How diverse are our donors?” “What’s their average income?” And on and on. Questions like these can be answered and special segments prepared only if your database contains the specific attribute—age, gender, real estate, wealth—you want to select on. As part of their data stewardship efforts, many organizations, unfortunately, spend far too much on data appends to answer these questions. Often, they’re charged on the total number of records being analyzed rather than for a specific attribute. These append services usually come with expensive minimums. Fortunately, the new TrueGivers and NeonCRM Integration enables you to profile your entire database routinely, without expensive minimums or contracts. Segmenting your database using specific attributes such as age, gender, income or presence of children allows your organization to target individuals with messaging that is relevant to them. Bottom line: This new integration is designed to not only improve your immediate fundraising results, it also helps you retain donors and other important contacts. Interested in trying out the integration? Click here to learn more about how the TrueGivers and NeonCRM Integration!